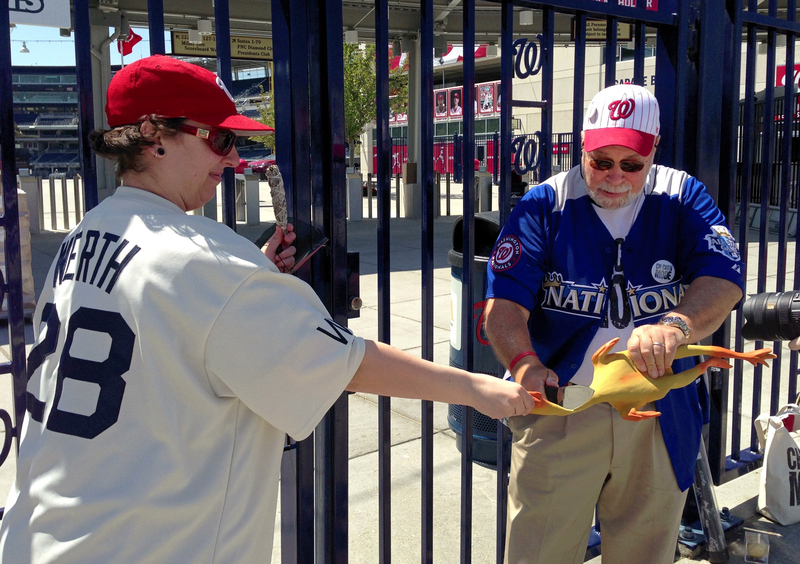 Nats fans plan rubber chicken sacrifice for 5pm Sunday outside Nationals Park | Let Teddy Win! Following Saturday’s epic 18-inning game 2 loss to the San Francisco Giants, a chicken will be sacrificed at 5pm today in front of the Nationals Park Center Field Gate. 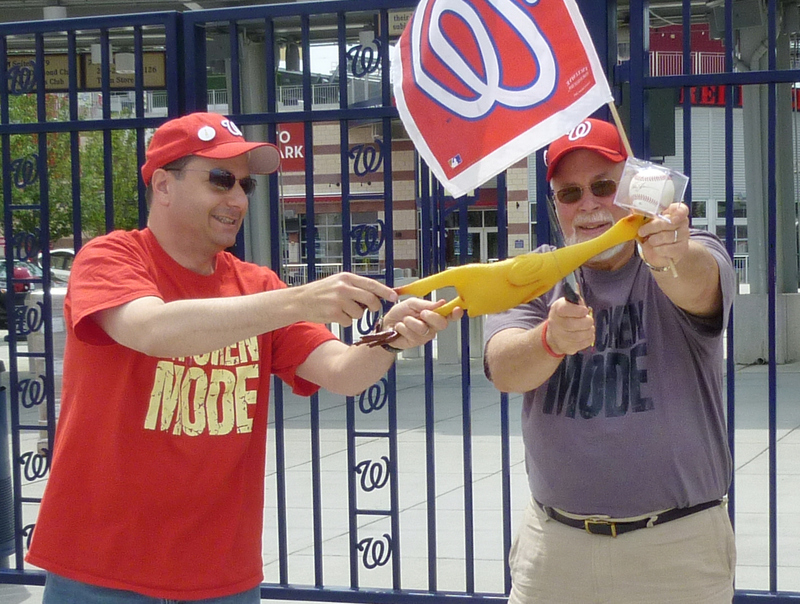 Longtime readers know that since 2005, Nationals fan “Rubber Chicken Man” Hugh Kaufman has sacrificed rubber chickens to “get rid of the bad juju” whenever the team has run into a bit of trouble. Kaufman is encouraging fans to come “honor our pitchers and help wake up our bats,” and promises to bring a number of baseball voodoo items to help ensure success. When the Nationals had their backs to the wall in the 2012 playoffs, Kaufman performed a similar ritual, sacrificing a chicken before Jayson Werth’s historic walk-off home run carried the team to a Game 4 victory in that year’s NLDS. Kaufman says has has “sacrificed dozens” over the years. In fact, he says 2014 is the only year in which he performed the ritual only once. This season’s only sacrifice came after a Memorial Day loss that dropped the team’s record below .500 after 51 games. After that, the Nationals went on a tear for the rest of the season, winning 71 games vs. just 40 losses. As it is Sunday and there is no game today, plenty of free parking should be available. 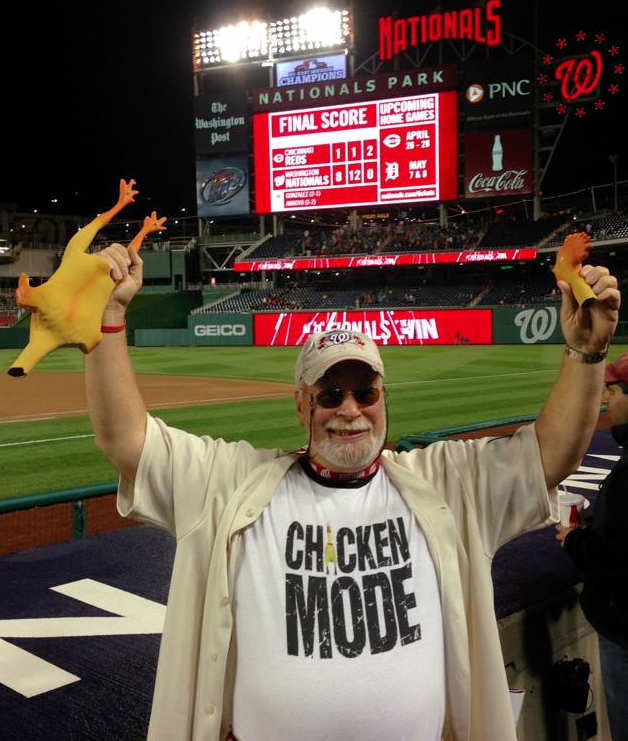 Kaufman is encouraging fans to wear their Chicken Mode t-shirts.